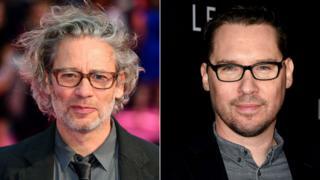 Image caption Fletcher's appointment followed the departure of Singer, who was accused of being "unreliable"
Directing duties for Bohemian Rhapsody, the Freddie Mercury film biopic, have been taken on by Eddie the Eagle's Dexter Fletcher, after the firing of Bryan Singer. The actor turned Bafta-nominated director was previously set to direct the Mercury film only to leave the project in 2014. 20th Century Fox said production would resume next week. Rami Malek will play the Queen singer in the film. It is expected to be released in December 2018 as planned. The troubled project has faced a series of setbacks since it was first announced in 2010. Singer's departure was confirmed this week, with a source attributing his exit to "a pattern of unreliable behaviour on set". The Usual Suspects director said he was disappointed to leave the film, which he described as "a passion project". In a statement issued through his lawyer, Singer said he had asked for time off to deal with a "pressing" family matter. "Unfortunately, the studio was unwilling to accommodate me and terminated my services," he continued. Filming has been taking place in the UK, with Ben Hardy, Joe Mazzello and Gwilym Lee starring as Queen's other members. Before turning to directing, Fletcher was best known for his roles in Lock, Stock and Two Smoking Barrels and ITV's Press Gang. He made his directorial debut in 2011 with urban drama Wild Bill, for which he was nominated for a Bafta Film Award, and also directed Sunshine on Leith in 2013.